It's always been difficult to give a one-sentence synopsis for Terraria. 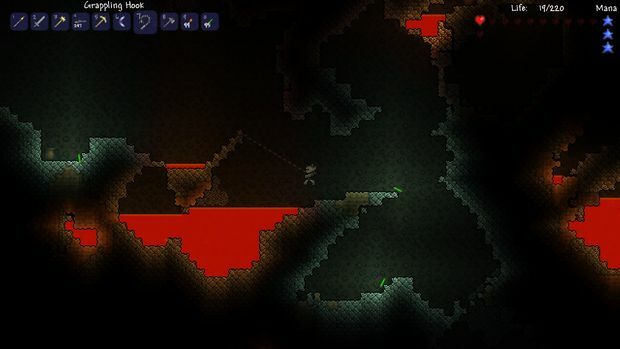 When it was released on PC in 2011, the first description that many gave was that it's "like a two-dimensional Minecraft," but that doesn't really do Terraria justice. More experience with it brings about the description that it is a "sandbox-style Metroidvania," and while that description is apt, it still doesn't hit exactly why Terraria is so fantastic. Boiled down to its essence, Terraria is about discovery. Throughout the game, that discovery comes in many forms: exploration brings about the discovery of new environments, resource collection brings about the discovery of new craftable items, and progression through the game brings about the discovery of not only new enemies to fight, but also entirely new game mechanics to consider. 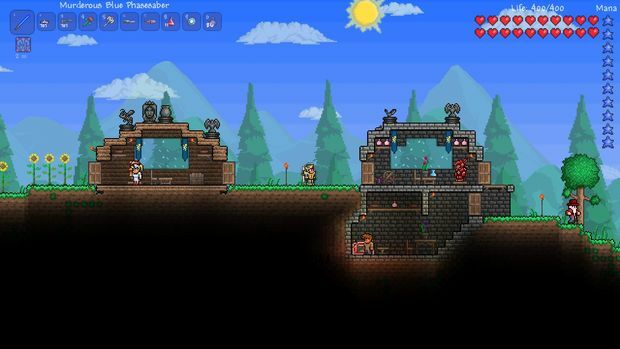 With Terraria's recent release on consoles, there is even more to discover than before. However, some things are better left undiscovered. 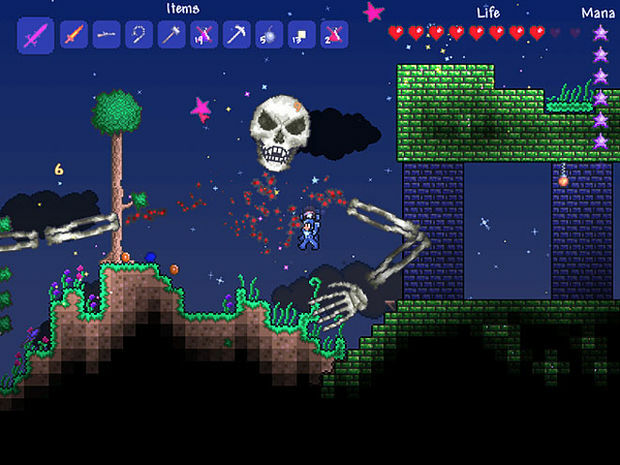 Terraria is set in a two-dimensional open world. On the PC version, players are dropped into a procedurally generated world with little direction other than an NPC and night closing fast. Without a handy guide, many would be lost. One of the additions to the console version is a tutorial, which was sorely needed to mitigate the aimlessness of the early game. The tutorial sufficiently gives the player short term goals and teaches the mechanics of the world without giving away too much about where the adventure is going. After the spawn point is secured with a lightly defensible living space, the real meat of the game begins. Traveling along the surface in either direction reveals new biomes, each with their own flora and fauna. More important is downward travel, into the network of caves waiting to be explored. Many of the useful resources can be found there, including ores that can be used to craft better tools, weapons, and armor, which can then be used to dig and fight more effectively. One of the core elements of Terraria that sets it apart from being a 2D Minecraft is that as you explore, find new things, and gain power, the world itself reacts. While there isn't exactly a written narrative, there is a definite progression of events, and it makes the world feel more alive. In addition to the progression of events, there are also triggers that affect gameplay on a fundamental level. The early game is largely about resource collection and survival. Digging into the dirt focuses more on exploration and combat. Even further down and it almost becomes a puzzle game as the player attempts to mine ore while avoiding lava flows. And that's not even to mention what happens when you instead decide to explore up. 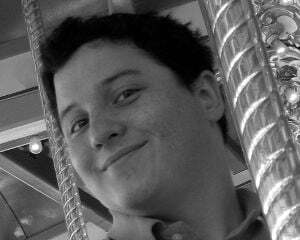 Simply put, Terraria is enormous, not only in size, but also in scope. Just when you think you have seen everything there is to see in the world, you find something new. Just when you start to get comfortable, a new element shows up to contend with. Even though it happens continually, it is somehow surprising every time. Terraria is delightful, but it has been for almost two years now, and many already know it. The question this review aims to answer is whether it remains so from its port to consoles or if it suffers in any area. One of the biggest worries that Terraria fans had regarding the console port was how to best transition from the quick, accurate control afforded by the use of a mouse to the less precise dual stick setup. To emulate the control of the PC version, the console versions have two separate control schemes. Auto is quick but imprecise, allowing the use of the right stick to point in a general direction of action. Manual is precise but slow, allowing the player to choose exactly which square to target. While it sounds less than ideal, switching between the two modes is a matter of clicking the right stick in, and with a little practice it works fine. Certain things, like digging a three-block-high horizontal tunnel, are even easier on console than they were on PC. The other worry with the switch from a keyboard was that items and tools would not be as easily accessible. As with the original version, there are ten slots in the backpack for equipment to be used, but for the console version, switching between these pieces of equipment requires cycling through each with the shoulder buttons. There is functionality to map up to four items to the cardinal directions on the D-pad, but it strangely must be re-mapped every time you start playing. Perhaps the most exciting aspect stemming from the transition to consoles was the addition of more accessible multiplayer. While online multiplayer exists for the PC version, it is not easy do without the use of third party software. Joining a game on the Xbox 360 is as easy as one would expect, but it's afterwards that the problems show up. When hosting, the game runs well enough, but when joining somebody else's game, the lag can be debilitating. While lag doesn't matter much during the slower portions, it can be infuriatingly unplayable during tense combat sequences. Worse yet, if you travel quickly enough in a friend's world, the terrain will not load in time, causing you to fall all the way to the bottom of the map with nothing to stop you. One of the welcome additions is a map screen, which shows the areas you have been to and makes hunting for rare ore easier. When joining a world online, you can uncover the map in the same way that you would in your own world, but its progress is not saved as it would be for your own, so rejoining the same world in the future starts you at the beginning with respect to the map. Considering it's still more than having no map at all, it's difficult to get too upset about it, but it would have been nice if it were saved. In addition to online play, the port also allows up to four-player split screen multiplayer, but it has its own problems too. Even with only two players, Terraria suffers from significant drops in framerate at times. Aside from that, the interface works surprisingly well using only a fraction of the screen real estate, but due to the slowdown, local multiplayer can still be a pain for combat or tricky platforming sections. Some new music tracks have been added, though most of the background music remains unchanged from the PC version. The soundtrack is full of catchy tunes that function to let the player know where he is in the world. It isn't the most amazing collection of music, but each track is fitting for its environment. The last notable pieces of new content are pets to collect and an additional boss to fight. 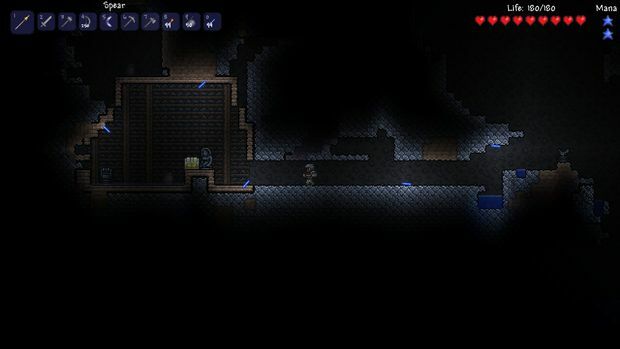 While neither is a substantial addition, each adds to the already lengthy list of cool things to discover in the world of Terraria. Terraria is an incredible experience, and no game has filled me with the same sense of wonder and drive to explore in a very long time. In this port to consoles, those feelings are preserved, but perhaps not as elegantly as they could have been. The control scheme turned out better than expected, but the multiplayer functionality is far from ideal. Still, I cannot recommend this enough to anybody with a heart for exploring the unknown and an inherent passion for discovery.